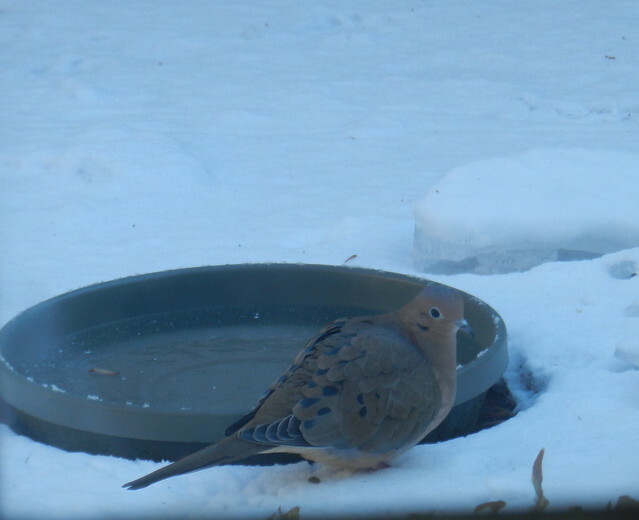 I think it's amazing how different the mourning doves look in the sunshine and in the overcast cold weather. All birds are like this but somehow looking through my shots at the dove puffed out in the cold and relaxed in the sun, the differences struck me in particular. Wednesday some of the ice and sleet had melted from Monday night's storm when a fast snow shower ripped through in early evening to coat everything before the temperatures took a nose dive. The rufous sided towhee (female) had a mouth full below. 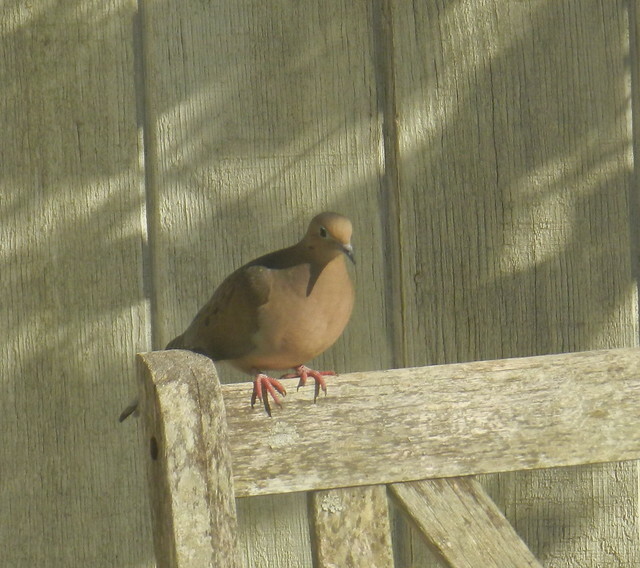 I saw a lot of doves on my deck this past week. 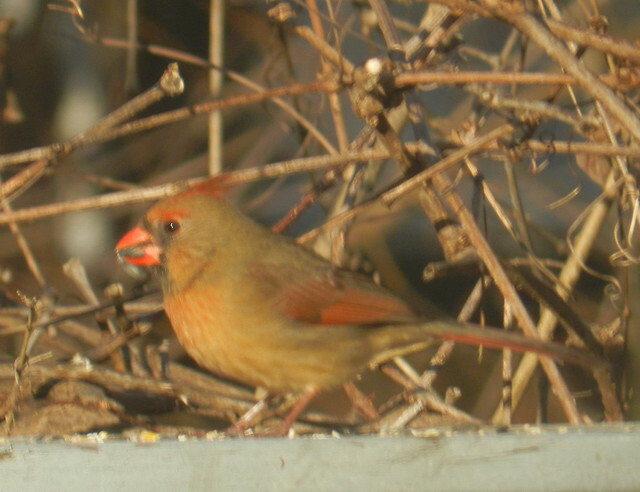 The female cardinal also got caught with her mouth full. 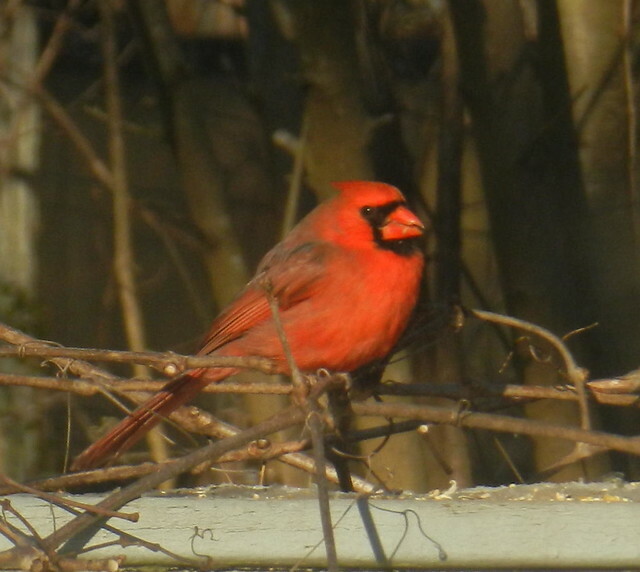 Male cardinals are winter's bright flowers. 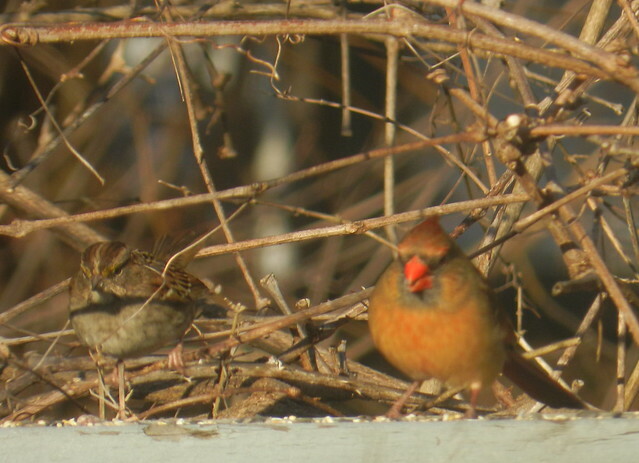 Next to the sparrow the female cardinal looks rather colorful although they look muted next to male cardinals. Nice to visit your blog ! Your photos are always wonderful ! wow, I didn't know that a female bird could be so beautiful! a lovely series, Carver! I love when the birds puff up but I know they are cold...wonderful shots. 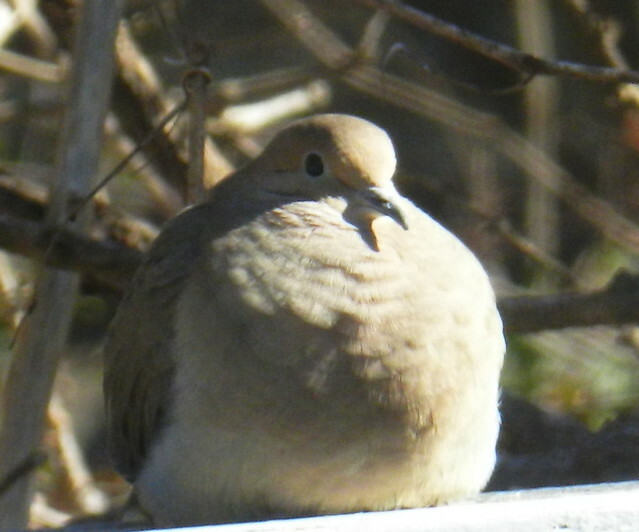 I have never seen a dove so cute and chubby. It must be a method to keep warm in freezing weather. The house scene in the distance looks picture-perfect for a postcard. Gorgeous photography of nature's gems ~ the dove puffed out is amazing! Wonderful bird photos, especially the doves! Wow! That dove is very puffed up!! What colourful and gorgeous birds! You have captured your lovely visitors so well. Beautiful photos ! Yes, because of the cold, they all look very round ! I like how you referenced the cardinal as winter's flower!!! Hello Carver, the puffy dove is pretty and I love the Towhee. Pretty bird! The weather has been frightful, very cold here today.. Have a happy day! Wonderful captures Carver. 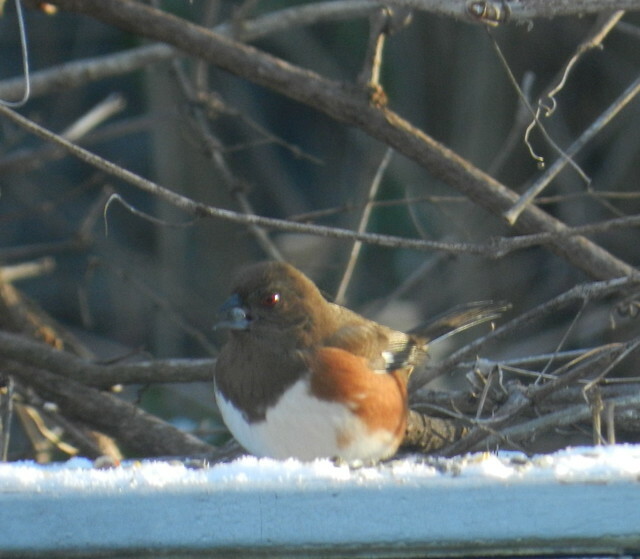 That's a handsome towhee! It's fun to see them all poofey and to know it helps against the cold. Great shots. Great photos as always Carver. That dove looks like it's about to explode! 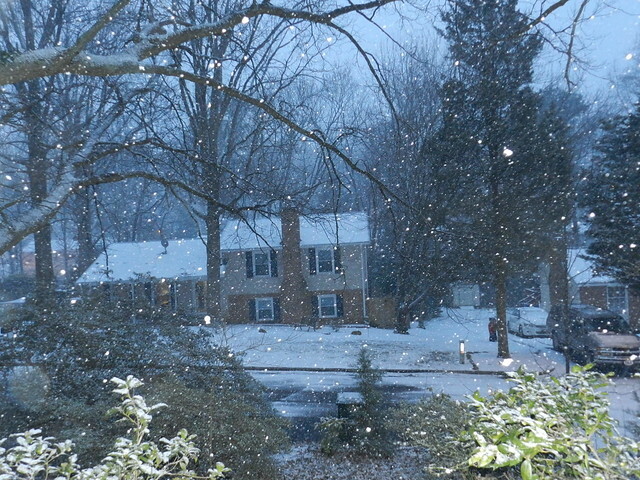 I like your snowy scenes. The dove has a beauty all of its own. This is a lovely collection of photos Carver. I do enjoy hearing the doves and think they are such a pretty bird. You have a very nice series of birds here. Mrs Cardinal is every bit as pretty as her colorful mate in my opinion! Gosh the mourning doves even puff up here in Florida on cool mornings.... They do look different when they do that. Always love to see the beautiful cardinals. Your puffed dove looks so soft in the light.